And so the outpouring of wonderful music from Norway continues. 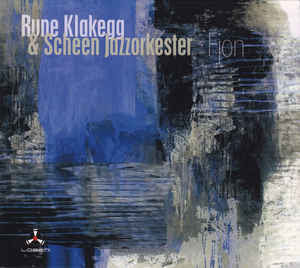 This time it’s the work of pianist, composer, arranger and erstwhile jazz journalist Rune Klakegg, who has been on the scene since the late 1970s, and who wrote the material for this album over many years. Much of it has been recorded before in various forms; some of the tunes were originally intended for big bands, some for trios, and everything in between. This particular album is performed by a large ensemble – in fact, with 15 musicians on board, it’s only slightly short of a big band. However, a lot of the time the Scheen Jazzorkester doesn’t quite sound like a conventional big band, with defined sections of trumpets, trombones and woodwind; instead there’s more of an orchestral feel, with instruments individually scored. And among them there’s also room for a vibraphonist (Rob Waring), a guitarist (Sondre Stordalen) and a singer (Nina Gromstad). The album is richly melodic, although modernist in feel – there’s no swing. As is the case with many Scandinavian visual artists, Klakegg’s true forté is noir: I would love to see a film featuring the ominous waltz Achille, named for Achille-Claude Debussy. This apparently started life as a trio piece, but has since evolved into a dangerously restrained, prowling mini-epic, with solos from André Kassen on soprano, Thomas Johansson on trumpet and Audun Kleive on drums, underpinned by the bass clarinet of Line Bjørner Rosland and bass trombone of Åsgeir Grong. The dark mood lingers on with Slapback, featuring a passionate solo by Stordalen, and a Sweet Smell of Success-like blaring trumpet motif. Later, the only non-original composition, Henry Mancini’s Moon River, has been reharmonized to sound as sinister as possible – completely undermining the now precarious-sounding sentiments sung by Gromstad. In short, if we’re talking rivers and moons, it’s far more Night of the Hunter than Breakfast at Tiffany’s. Din meg apparently translates as ‘Yours me’, which frankly isn’t much of a translation; but no matter, as it affords a lovely vibes solo from Waring. The sequencing of the album has been carefully considered: Din Meg ends on a long held chord, which is how the next track Blub Club begins. Det er noe muffens her (‘There’s something fishy here’) takes us once more into the realm of unease and melancholy, while on the closing title track, an overcast dawn finally breaks. Fjon is a terrific album by any standards – complex, intriguing, and beautifully played by all concerned.